Winter is hard on your vehicle. Salt and slush attack its good looks, but these corrosive elements can also damage your vehicle’s paint, wheels, and even its suspension components. 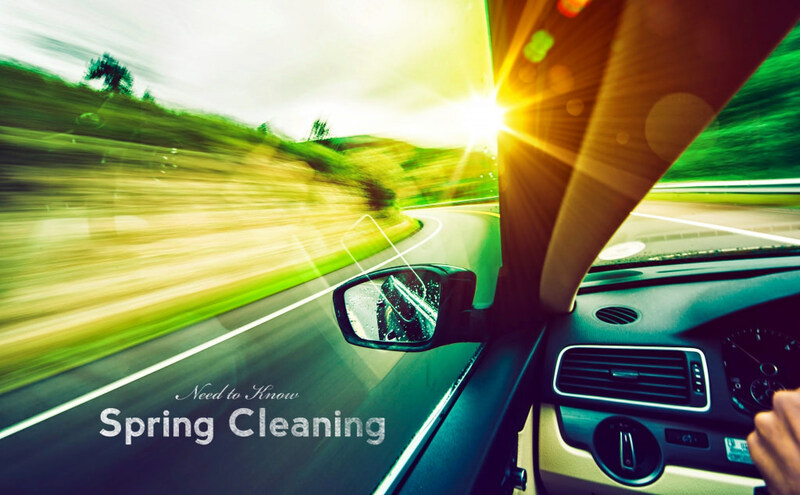 Your home benefits from a spring cleaning, and so does your vehicle. If you are not keen on detailing your own vehicle, or if you do not have a driveway or the gear to do it yourself, we recommend getting to know a local detailer. We are big fans of Island Detail & Color, they are just around the corner from our shop, are very reasonably priced, and by the look at how busy they are, very popular indeed. If you filled your trunk with winter stuff, now’s the time to empty it. Emergency salt or sand bags, shovels, boots and other items may be necessary in foul weather, but you won’t need them for summer, and that extra weight will hurt your fuel economy. Clean out the cabin, too. Check under the seats for lost mittens, empty coffee cups, or anything else that might have taken up residence there. Vacuum the carpets thoroughly, including high up under the dash, and under the seats. If your rear seats fold by flipping the seat cushions, pull them up and grab the dirt that has accumulated there. Vacuum the trunk – lift the carpet, if you can, to get the stuff under it – and if you have a hatchback, pull up the cargo floor and clean out any compartments under it. Don’t forget the glovebox and centre console box, and use the vacuum’s wand attachment to get any dirt hiding in the crevices between the seat cushions and backs. If the dash and console are just dusty, wipe with a damp cloth. If you’ve slopped coffee into the cupholders, or if the dash is really dirty, use a spray cleaner with paper towels or a soft cloth. You can spruce it up afterwards with vinyl and plastic protector – spray-on or wipe-on is up to you – but avoid any that contain silicone or solvents, and don’t let them get on the glass. Don’t use it on the steering wheel, which could become too slippery. Use glass cleaner and paper towels. You can buy cleaning pads on a handle specifically made for that tight spot where the windshield meets the dash. Make sure you’ve cleaned the dash first; if you don’t, any cleaner overspray can leave hard-to-remove spots in the dirt. Wipe the overspray off the dash before you apply any vinyl protector. Note: don’t spray glass cleaner directly on the rearview mirror, as it could get inside. Spray a cloth or paper towel and use that to clean the glass. Leather needs special care to help prevent the upholstery cracking as it ages. Use leather cleaner and follow up with leather conditioner. There are several two-in-one products on the market and they’re fine most of the time, but using two specific products is best for this deep-down spring job. Salt build-up can rot steering and suspension components. Wash the undercarriage thoroughly, getting into all the nooks and crannies until the water runs clear. Note: Check your municipal bylaws. Some forbid you washing your car at home, primarily because the run-off goes directly into the storm sewer — and from there, untreated into the nearest lake or river. If you do clean your car at home, washing it on grass or gravel can help lessen the environmental impact of run-off. Rinse the car completely to loosen the dirt, soap it with a soft mitt or sponge, and then rinse thoroughly again. Dry with a soft terry or microfibre towel, or a chamois. As you’re drying, check every inch for chips or scratches. You’ll want to touch them up before they morph into rust bubbles. For shine, spray-on liquid wax will do in a pinch, but a thorough polish with paste wax will give the best protection. Give your alloy wheels a thorough scrub, then protect them with a coat of wax or rim protector. Brake dust will etch into them, so be sure to clean them regularly. You can also use a tire cleaner and dressing to make the rubber shine.